Purchasing a vintage car can be the ticket to a unique looking car that sets you apart from the rest of the pack on the road. In addition to turning heads, they're a terrific investment. For the history buff, a classic car is automotive history in the flesh -- or steel and chrome as it were. Vintage cars can be tricky to purchase, though. There are many things you should be aware of, and if you buy one that's a lemon, you're going to be sinking tons of money into it for repairs. Before you buy a vintage car, you'll want to do your homework. 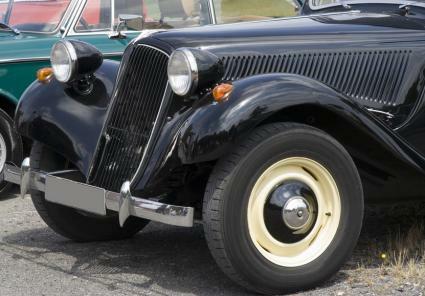 There are some steps that you should take when buying a vintage car. Some of these are similar to steps that you might take when buying a new car, while others are specific to buying older cars. When buying a vintage car, it's even more important to do your research. Consult all the auto and vintage car magazines on the market for hard facts on the model that you are interested in. You can also use these to help you decide what you are willing to pay. It is very hard to find the vintage car of your dreams in one perfect piece. There's a good chance that the car you buy will not be complete in some respect. You're going to be hitting salvage yards, Internet ads, garage sales, and more to find what you need to get your car into tip-top shape. You must set a budget for how much money you're realistically going to be able to spend on your vintage car. Include the parts you'll need to finish the car. Few things are more frustrating than running out of money before you even get the automobile up and running. If that happens, you're going to be stuck with an inert piece of metal on your lawn instead of a car, or even worse, playing salesman. A good way to avoid hitting this obstacle is to talk to other vintage car owners about what you can expect as far as expenses and work go. Online classic car forums are good places to visit when you need advice. It can be easy to buy the wrong thing or a poor quality piece when restoring your car. Make sure that you see everything that you need to buy in person. Barring that, get detailed, close-up, full-color pictures. Automobile Inspections, LLC is a professional service that will inspect parts for you when you can't look at them yourself. Also, remember that many vintage cars aren't necessarily recommended for everyday use. If you are going to be using your vintage car everyday, make sure it's made up of dependable internal parts, ones that are easy to replace. Save a little bit of money for problems that can and will arise with your vintage car, especially if it is your primary means of transportation. There are a number of terrific spots online to purchase vintage cars and vintage car parts. Car Stuff: Classic Car Parts & Car Accessories: Tons of links to sales of parts for older and vintage cars. Great Old Cars: Check out an amazing collection of advertisements for classic and vintage cars for sale. Includes street/hot rods, muscle cars, foreign cars, and classic trucks! Whether you bought it to drive it or show it, a vintage car is something that people will remember you for. Remember that while a vintage car may cost you money, it is an investment. It will, at worst, retain the value that you paid for it. However, it is also likely that the car will continue to increase in value after you buy it, especially if you make improvements on the vehicle. The most important thing is that you enjoy the car.